UNITED NATIONS, November 18 -- Yemeni Nobel Prize winner Tawakkul Karman came to the UN on November 18, met with the President of the General Assembly Nassir Abdulaziz Al-Nasser and then described the meeting to Inner City Press. Video here, and embedded below. Ms. Karman said the President of the General Assembly, formerly the Ambassador of Qatar to the UN, will "work with us to put pressure on the Saleh regime... He will help us find a way to freeze assets." This is at odds with, or more detailed that, the PGA's Office's read-out, below. Earlier on Friday, Inner City Press had asked Saudi Arabia's Permanent Representative Abdullah Y. Al-Mouallimi about the Saudi role in the Gulf Cooperation Council initiative on Yemen, that it provides immunity for Ali Saleh and his associates. Al-Mouallimi said that "the GCC agreement was signed by the relevant parties in Yemen" and now ostensibly belongs to "the Yemeni people." UN Video here, from Minute 7:50. Inner City Press asked Tawakkul Karman about this claim, that the GCC immunity deal "belong to the Yemeni people." Karman replied that "we are not talking about the GCC" anymore, but rather the Security Council's resolution which she said "removed" immunity, at least for "those who committed crimes." She said she was in New York calling for "implementation" of the resolution. 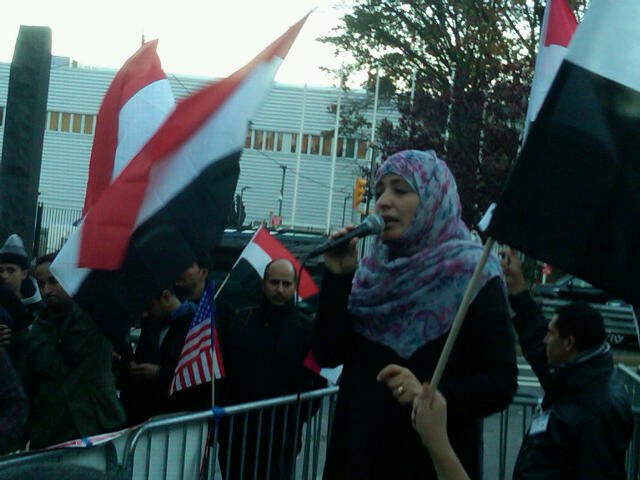 On Friday before Karman's meeting with the President of the General Assembly, Yemenis demonstrated across the street from the UN, chanting "Saleh must go" and that both the UN and "Obama must decide, human rights or genocide." Ms. Karman told Inner City Press, after the clip, that she met with US Ambassador Susan Rice. Close observers say that the US was behind the GCC initiative which offered immunity to Saleh. Watch this site. The President of the General Assembly, H.E. Mr. Nassir Abdulaziz Al-Nasser, today met with 2011 Nobel Peace Prize winner, Ms. Tawakkol Karman of Yemen. The President of the General Assembly hailed Ms. Karman as a global symbol of women’s empowerment who has brought honour and pride to all women, especially in the Arab world. He congratulated her on the award of the Nobel Peace prize and highlighted the award committee’s acknowledgement of the importance of UN Security Council Resolution 1325 on women, peace and security. President Al-Nasser and Ms. Karman also exchanged views on the Arab awakening, developments in Yemen, as well as the situation in the Middle East and North Africa.